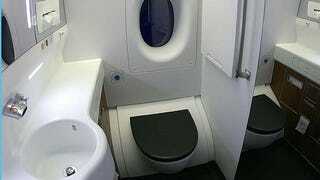 What happens when you flush a plane toilet? Some interesting facts have been recorded, however. Second World War pilots, for example, couldn't stand the "slop bucket" loos – or "Elsans" – found on board Lancaster bombers. They often overflowed in turbulent conditions, or were tricky to use. Crews sometimes preferred to urinate or defecate into containers, before simply hurling their business out of a window. Some reputedly jettisoned full Elsan toilets on German targets along with their bombs – an early example of biological warfare. James Kemper's modern vacuum toilet wasn't patented until the Seventies, with the first one installed by Boeing in 1982. Before that, plane loos were unwieldy boxes that utilised large quantities of blue liquid [actually known as "Skykem", a reader has reliably informed us] and were prone to leaking. Kemper's nifty device uses a little liquid, but relies on non-stick coating and vacuum suction to wash away the nastiness. "There is no way to jettison the contents of the lavatories during flight, At the end of a flight, the blue fluid, along with your contributions to it, are vacuumed into a tank on the back of a truck. "A man in California once won a lawsuit after pieces of "blue ice" fell from a plane and came crashing through the skylight of his sailboat," added Captain Smith. "A leak, extending from a toilet's exterior nozzle fitting, caused runoff to freeze, build, and then drop like a neon ice bomb. If you think that's bad, a 727 once suffered an engine separation after ingesting a frozen chunk of its own leaked toilet waste, inspiring the line "when the s*** hits the turbofan.""